J.K. Rowling's creation finally returns to the big screen in Harry Potter and the Half-Blood Prince which is based on her sixth novel in this highly popular series. Although originally scheduled for a release in December 2008, the movie has finally made its way to the public and best of all, the movie boasts an impressive IMAX 3D opening sequence which really transcends the story to the next level, making it quite "magical". Unlike the previous films, Harry Potter and the Half-Blood Prince is a considerably darker and more plot driven movie which creates a mixed affair and at times seems to mimic the teenage vampire romance Twilight. 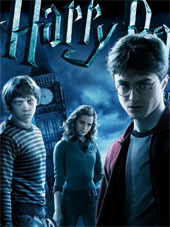 The story of course revolves around Harry Potter, however Ron Weasley and Hermione Granger seem to be in the background in this movie as Harry is "undercover" for Professor Dumbledore. In relation to the story, for the world of magic and the Muggle world to be free of Voldermort, the vessels holding his soul must be found and destroyed, unfortunately this is easier said than done. Dumbledore believes that Professor Horace Slughorn, a former teacher of Hogworts holds the key to Voldermort's defeat as he was the one-time teacher of Tom Riddle, aka Voldermort. Through wit and guile, Harry must somehow befriend Slughorn in order for him to lower his guard and tell him the truth of a fateful encounter one evening with Voldermort. Although this is the main theme in the movie, this current instalment of Harry Potter revolves far too much on the romantic angst of the characters, especially between Herminie and Ron plus Harry and Ron's sister Ginny. Regrettably for myself, this theme feels too forced and lessons the "magic" of the series and talking with a colleague of mine who saw the movie, he agrees, however noticed that key elements and anecdotes from the novel were also missing in this movie. At times I was scratching my head at the plot, however my colleague understood everything due to his previous experience from reading the novels. Without spoiling the plot, this book made headlines when it was revealed that one of the major characters in the series would die and this parallels Star Wars the Empire Strikes Back in the solemn ending. Consider it the coming of age story for Harry and his friends. The actors in the movie all reprise their roles quite well, especially the instigator in the movie who is played by Tom Felton and plays the troubled Draco Malfoy who is finding it difficult to be "puppeteered" by Voldermort's lackeys. As per usual, Daniel Radcliffe as Harry, Michael Gambon as Professor Albus Dumbledore are perfect as the lead characters. Alan Rickman also returns as Professor Snape and once again revisits the story of whether he is evil or good and the ending is a real highlight for the character and I'm sure we will see more of him in the next movie. Helena Bonham Carter stars as Bellatrix Lestrange, however her wonderful acting is side tracked in the movie, however the star for me was Jim Broadbent as the dotard Professor Horace Slughorn. Featuring drama, romance, comedy and a touch of romance, Harry Potter and the Half-Blood Prince will definitely appeal to the younger generation or those who enjoyed the novel but for me, unfortunately something was missing. It was not a bad movie per se, however it lacked the flow from the previous movies and dare I say, a little tedious, even on IMAX. IMAX! That brilliant four letter word! The biggest problem with Harry Potter and the Half-Blood Prince on IMAX is that the movie is visually quite dark. The clarity of other IMAX movies such as The Transformers: Revenge of the Fallen or The Dark Knight seems to be missing in this title which unfortunately hampers the 3D aspect of the movie. Sure, the 3D bits were great, however the clarity and sharpness was lacking. Thankfully the sound quality more than made up for this shortfall and Harry Potter and the Half-Blood Prince sounded phenomenal through the IMAX sound that boasts a 15,000-watt digital audio system. At the end of the day, Harry Potter and the Half-Blood Prince was probably my least favourite film in the series, probably due to the sometimes convoluted plot and Twilight-esq romance between the characters. For those viewers who are not thoroughly into the novels, a recap at the beginning would have been nice to jog our memories. Viewers who enjoyed the novels will more than likely enjoy the movie immensely, provided they can ignore certain changes and omissions in the transfer from the book to the big screen. Needless to say, I did enjoy certain elements of this movie, however it seemed like a breather before the climatic conclusion. With that said, there are two more Harry Potter movies to come which are being filmed back to back and unfortunately "us" non Harry Potter novel fans will need to wait until the next movie.